Javan director Garin Nugroho is a slight man dressed in pale jeans, a black T-shirt and beige anorak. As he introduces his latest work, Opera Jawa, to the Barbican audience, it is impossible to predict how much colour, music and movement is about to appear on screen. Opera Jawa is a retelling of a story from the ancient Hindu text – the Ramayana. It sings the story of a love triangle in modern Java which leads to domestic turmoil, mass political unrest, and death. Nugroho, who is known for his socially-conscious, indigenous films, tells the audience that in the making of the film 60 songs were composed, 70 dance routines were choreographed and seven art installations were created. Opera Jawa was commissioned last year by the New Crowned Hope festival – funded by the city of Vienna to commemorate Mozart’s 250th birthday – and fittingly, the film takes the form of a requiem. Perhaps predictably, Peter Sellars – the man who staged a series of Mozart’s works re-imagined for New York settings – was chosen to curate the New Crowned Hope project. At the Barbican screening Sellars introduces Opera Jawa as ‘the first film of the 21st century’. As he discusses the making of the film with its director, it becomes clear that these two men from different backgrounds share the same vision – combining old works with challenging new art forms. 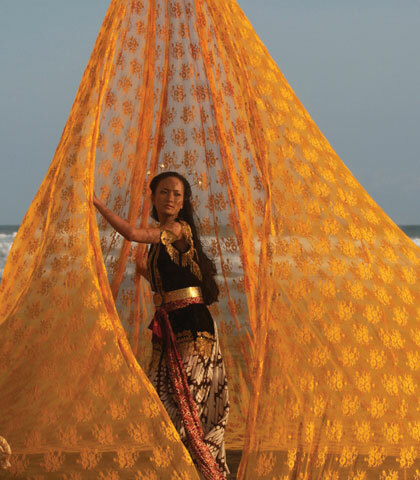 Lisa Williams: Opera Jawa is a requiem for all those who have died in natural and man-made disasters in Indonesia. Can you tell me a bit more about this? Garin Nugroho: The film is about disaster and violence. The three main characters are symbolic in the same way as classical Javan puppets are. Siti means ‘land’. She represents what has happened to the people as a result of natural disaster, conflict and the fight for holy land. She goes through three months of conflict when people fight for her body for these different reasons. She says in the film, ‘I’m not a holy land, I’m a human being’. The character Ludiro represents people who have power in the economy and military and who abuse this power. Setio represents the people who are disempowered and so become violent. That is the way of the world. LW: Was it important to you to make an intrinsically Javan film? GN: It was important – in the film there are many popular elements of Javan culture such as the market places, the clothes, the Javan puppets. The movement and the dance are very Javan. But I think the most important thing was the gamelan music. This is the first film accompanied by an entirely gamelan soundtrack. The soundtrack of the film reflects how the medley of art, music and dance can work together to create something incredibly valuable like it does in Java. We live in an oral tradition, and if you come to Java you can see how song, dance and art all live together. LW: The film is like a showcase of local talent – the artists, musicians, singers and dancers. You made an effort to get the artistic community involved but you also mentioned this move backfired – with artists producing a glut of work for you to include. Where did you draw the line? GN: Art is about being given room for productivity and the person who gives this room becomes like a hero. I gave artists room to be creative but I had the final say. It is like people are giving me small glasses of sake. Each time I drink one I become a hero to the person who gave it to me. But it’s up to me to control myself. Everyone wants to give me more and more sake, but I must control myself or else I become drunk. LW: You said the film was conceived five years ago – how does the final product match up to the original vision? GN: It’s better than how I thought it would be because so many artists gave me their ideas and creativity. So many people collaborated with me and each one brought their own ideas and their own spirit. They trusted me to deliver something, and it was wonderful to be given that space and it was the perfect time to make the film. LW: To what extent did the Indonesian reformation (following the 1998 revolution which saw the end to 30 years of authoritarian rule) affect your work? GN: We are still living the post-1998 moment. This is our euphoric moment, the moment for expression and for politics. For example, for the first time many different Indonesian cultures can come together – the Sundanese, the Javanese, the Papuans. Now these different communities can hold festivals and make films. After the 1998 revolution more than 1000 short films were made in a year. It was like a sudden euphoria. People could use film as a way to express what they had been feeling for years. I’ve been using films firstly to express our personalities, and secondly to express what I felt about what had happened in Indonesia. I make films because I want to start a dialogue about something. LW: What would you be doing if you weren’t making films? GN: If I hadn’t become a filmmaker I would be a politician. I was the chosen candidate in a number of elections in the past. I’ve also worked for non-governmental organisations because I’m interested in politics. But filmmaking is political itself. Film both affects and reflects the way we are thinking and reacting. LW: What was it like working with Peter Sellars? LW: When he has recreated operas and stage plays, Sellars has been criticised before for straying too much from the original story. Opera Jawa was very loosely based on ‘The Abduction of Sinta’ from Hindu text the Ramayana – was this deliberate? GN: Artistic interpretation has always been important. Reinterpretation is the beginning; it is what I call the support of creativity. I think what Peter did with Mozart was fantastic because he reinterpreted it. Through Opera Jawa people will learn about the Ramayana. Through reinterpretations people hear about the originals. LW: What is your last word on Opera Jawa? GN: The important thing about the film is that some of it is chaotic. If there is chaos, people will develop their own system, their own way of understanding what is going on around them. We tell the story of living in a chaotic place where the future is unpredictable. In Asia there is so much unpredictability, but that is the beauty of it.